On a daily basis especially before I got to work, I always make it a point to wash my face with a hypo-allergenic facial wash then apply a moisturizer followed by a sunblock. After that that's where my minimal "make-up" comes. For my body I used lotion. Before I used to scrub but now I can't since I have to remove first my warts otherwise it might spread all over me (which is the last thing I have in mind). Then sunblock comes next since its summer season here. After work once I'm home I'll take a rest for an hour or two then I'll wash my face with water then let it dry using cotton. 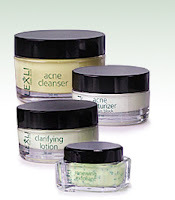 Then apply an Acne cleanser which is made by natural ingredients like Aloe Vera to prevent acne/ pimples. Given that the substance used for the product is natural, it gives me an assurance that it's safe for my skin and I don't have to worry for any allergic reactions from chemicals (given the fact that my skin is sensitive). Who says being a woman is easy?